What is normal? Everyone seems to have their own definition of what makes up normal. Merriam-Webster defines it as “according with, constituting, or not deviating from a norm, rule, or principle.” We mean that he or she is like everyone else, behaves as most people behave, and stays within current conventions. The idea of what is normal changes from one decade to another. Behavior can be normal for an individual when it is consistent with the most common behavior for that person. “Normal” is also used to describe when someone’s behavior conforms to the most common behavior in society. Definitions of normality vary by person, time, place, and situation – it changes along with changing societal standards and norms. Normal behavior is often only recognized in contrast to abnormality. In its simplest form, normality is seen as good while abnormality is seen as bad. Someone being seen as “normal” or “not normal” can have social ramifications, including being included, excluded or stigmatized by larger society. Although it is difficult to define normality, since it is a flexible concept, the existence of these ramifications also makes it an important definition. The study of what is normal is called normatology – this field attempts to develop an operational definition distinguishing between normality and abnormality (or pathology). The general question of ‘what is normal’ is discussed in many fields, including philosophy, psychology and sociology. 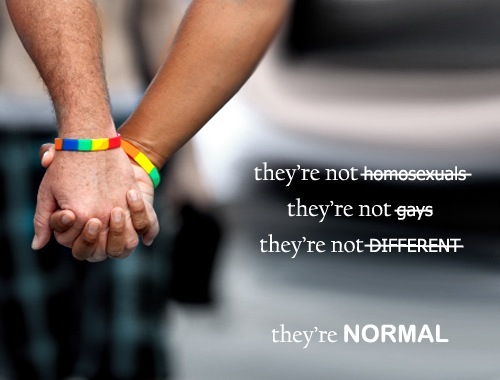 As part of the LGBT community, we are often seen by some as being abnormal, but really that is just an aberration. Because we are all unique, I don’t think there truly is anything as normal or abnormal. Teaching high school and college, I’ve known many students who buck the norm. They want to be different, and they have no desire to be like all of the others. Our former principal believed that for those who were outside the norm, bullying them back into the fold was natural and worth encouraging. I, and most of the other teachers, believed that he could not be more wrong. The uniqueness of students, and people in general, are what makes us such a wonderful society. We don’t live in a totalitarian society or even a utopia where everyone is the same and there is no reason for normal v. abnormal. For me, such a society would be a very boring place. Instead, it takes all of our uniqueness to make the world a better place. We all have our talents and individuality. How can we claim that just because someone is different (especially when we are all different in some way) that anything is abnormal? The definitions of normal and abnormal have long been reasons used for discrimination and hatred. We all have a little bit of discrimination in us. We all look at someone and think: they are a bit odd. Truthfully though, we should embrace those differences and allow the world to be a better place for it. We should embrace the rainbow of diversity. The use of rainbow flags as a sign of diversity, inclusiveness, hope and of yearning has a long history. This denotation goes back to the rainbow as a symbol of biblical promise. Aside from the obvious symbolism of a mixed LGBT community, the colors were designed to symbolize: red (life), orange (healing), yellow (sunlight), green (nature), blue (harmony), and purple/violet (spirit). Just as one of the most well-recognized symbols within our community denotes diversity, why would we even want a world that was “normal”? This entry was posted on Thursday, March 22nd, 2012 at 7:00 am	and posted in Inspiration, Miscellaneous, Theory. You can follow any responses to this entry through the RSS 2.0 feed. I'm the only one normal in the whole f…. world!!! Everyone else is abnormal…..everyone else is as crazy hs h…….!!!!! Or so speaks so many people from their pulipts, be that in the church, or whatever else maight be their stage.As for me, I am not normal, and I wear purple!! !